Paint the shoebox with black paint, and let it dry overnight. Using a large flashlight as a stencil, draw a circle in the bottom of the box. Make sure the box is on its side. Stab your scissors into the middle of the circle, and cut the circle out. 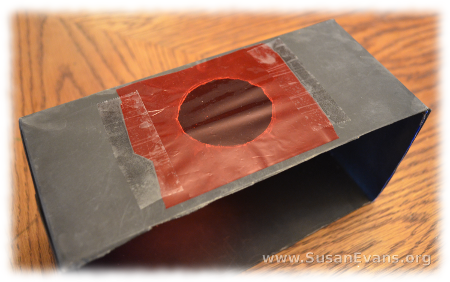 Tape red cellophane over the hole on the outside of the box. Cut out flames from the red, orange, and yellow papers, and glue them together with school glue. Hot glue the flames to the bottom of the box. 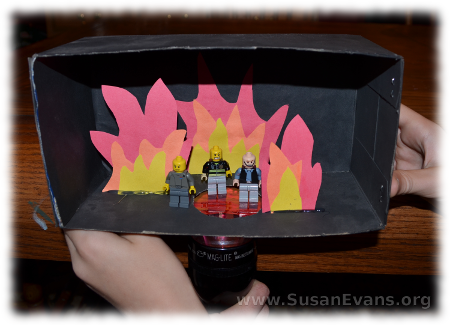 Now place your three toy men into the box.Your fiery furnace craft is complete. Tell the story of Shadrach, Meshach, and Abednego from the book of Daniel, adding a fourth toy figure at the end of the story. Yes, Jesus Himself showed up in the fiery furnace to protect these men from being killed. Through this story, God shows us that we do not need to be afraid when we obey God. These men refused to bow down to any other god, and even though it infuriated the king, they obeyed God. They trusted that God could save them from the furnace, “but even if He does not, we will not bow down to you, O king,”they said. The furnace was so extremely hot that the people who threw them into the furnace died from the heat. This was a miracle. God rules the universe. He controls every atom, and fire does not burn unless God says so. We can trust God, that He will help us through difficult times through His presence with us. 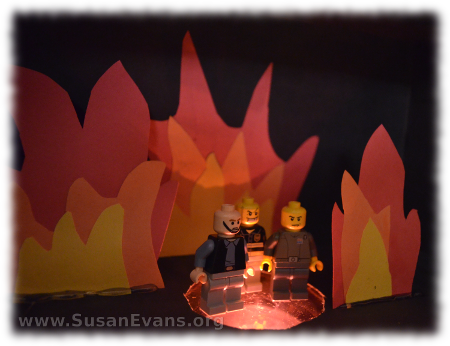 If you enjoyed this fiery furnace craft, you will love Using Simple Costumes and Props to Teach the Bible. You receive this 2-hour video for free when you sign up for the Unit Study Treasure Vault, which has an enormous Bible section that you will love! This entry was posted on Thursday, October 17th, 2013 at 8:00 am	and is filed under Bible. You can follow any responses to this entry through the RSS 2.0 feed. You can skip to the end and leave a response. Pinging is currently not allowed. Really great information on how to bring a story to life through craft and creation. I really appreciate the thought and detail you put into how to make a fiery furnace. A fun project – and a great way to learn the story of Daniel and his friends! I love following your blog posts for fun craft ideas at home. And it’s even better that they are biblically rooted so there’s a bible story in it most every time.